Home » Binary Objects and Image Loading » Show Me the Image! At this point, you have all your data, and you can even get the image for a particular user. All that’s left is to actually show the image, right? Yes, but you have an entirely different situation than when you had the image on a file system and just needed to point at that file. 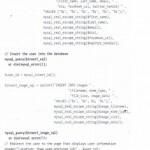 In this case, you must load the actual raw image data from your database and then somehow let the browser know, “Hey, this is an image, not just text. Display it like an image.” That’s not particularly difficult; but it’s different from what you’ve been doing. First, you need a script that can load and display an image. Once that’s done, it’s easy to reference that display script in show_image.phps Therefore, the script is the important piece, with all the new code. 1. Get an image 10 from the request. 2. 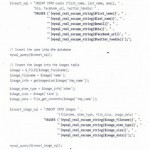 SELECT query from the images table by using that image 10. 3. 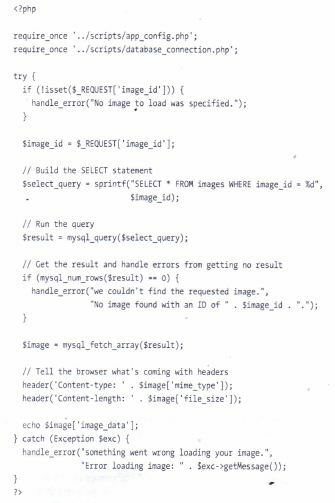 Run the SELECT query and get the results. 4. Grab what should be the only row from those results. 5. Inform the browser that it’s about to receive an image. 6. Inform the browser what kind of image it’s about to receive. 7. Give the browser the image data. 1. 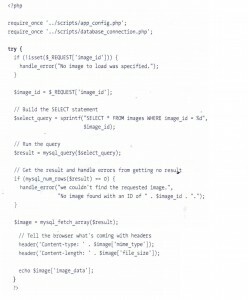 Ensure that an image 10 was sent to the script. 2. Ensure that the 10 maps to an image in the images table. 3. Deal with general problems that occur while loading or displaying the image data. Again, though, none of this is particularly hard. Time to get to work. First up, you need to get an ID to use for loading the image from the database. This step is also where you can do some initial error handling: if no ID comes in as part of the request, something’s gone wrong. Simple enough, and a lot like code you’ve written before in Show_users.php Once again, handle_error makes dealing with problems, if they do occur, a piece of cake. This statement assumes that as long as $result is valid, you have a row. Further, it ignores any rows other than the first one, knowing that the SQL query that generated these results can only return a single row. You have the information you want from images, but you can’t just toss that to the browser. Well, you could, but the browser would become confused. It’s used to dealing with HTML; but raw binary data is something else altogether. • What kind of content is coming? 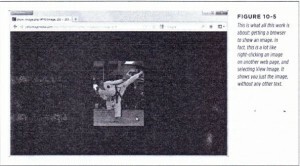 This information is passed to the browser through a MIME type. It is usually something like text.html or text.html, or in the case of images, images/jpeg or images/gif or images/png. • If that type is binary-as images are-what amount or size of information is coming? The browser needs to know so it can figure out when it’s done receiving, information. You already have the tools you need to communicate with the browser. This line communicates directly to the browser. It’s sending a header called Location to the browser. The value of that header is a location, a URL, and the browser knows ‘: that when it gets a Location header, go to the URL specified by the header’s value. 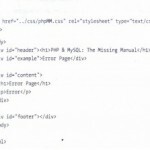 ″ Content-length Use this to provide the size (the “length” in bytes) of the information you’re about to send. At this point. 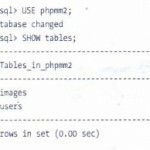 you have both of these pieces of information in your images table, in the mime_type column and the file_size column. 2. 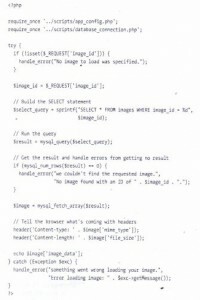 Build a SELECT query from the images table using that image 10. 6. 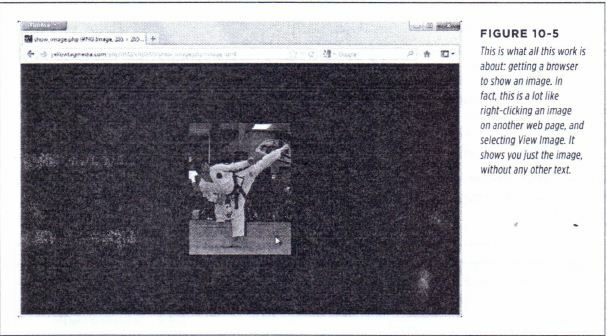 Tell the browser what kind of image it’s about to receive. All done; excellent. And, the script is short, too; clean and easy to follow. That’s a win by every account. The first two are done, but what about those so-called general problems? What happens is,for example, there’s an error sending the Content-type header? Or perhaps sending the Content -length header? And what about echoing out the image data? Doesn’t that seem like something that can go bad? 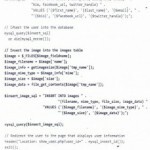 What if the image data is corrupt, or something happens in pulling data from the result set, or if the browser can’t handle a particular type of image that your script tries to send? In all of these cases, you receive an error that’s unaccounted for. And when you have these general sort of errors-errors that don’t fit into the black-and-white, can check ahead of time and make sure there’s no problem” mold-you need a way to deal with them. The rub here is that you can’t pin these things down. You need a way to say, “While this entire chunk of code is running, if a general problem happens, do this …” The good news is that you have a “do this” in handle_error. PHP provides a way to do just this with something called a try/catch block. The try part of a try/catch block defines a segment (a block) of your error-prone code to which you would like to pay special attention. 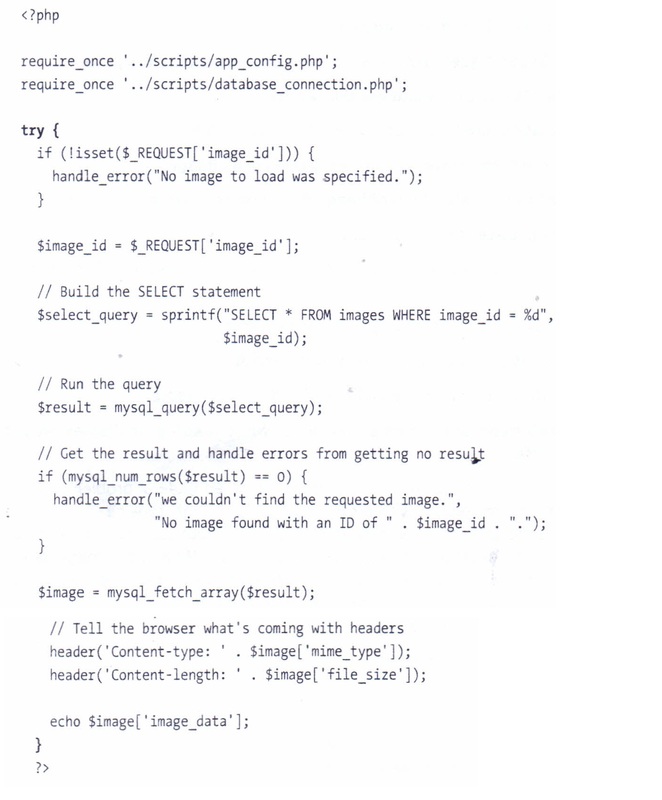 Essentially, you’re saying, “Try this code.” The catch path of the try/catch block is run only if an error occurs. If anything goes wrong within the try block, the catch part of the block runs. Not only that, but in the catch, an object is handed off: an Exception. This Exception has information about what went wrong, so you can report on that=say to a custom function such as handle error. You can see that this line almost looks like a function: the catch code takes control, and it receives an Exception object. $exc is the variable name of the exception, so you can reference that exception if you need to. With this code, anytime there’s an error, handle_error comes to the rescue. As usual, you pass handle_error a friendly string as well as some extra information for the programmers who might be looking on. In this case, that message comes from exc, and the getMessage method. 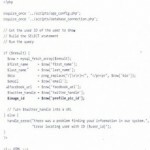 An object in PHP doesn’t have functions; it has methods. 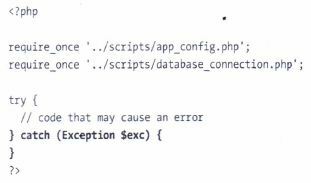 When this code runs, it reports any error that might have occurred and stops PHP from trying to continue on in the try block. All that’s left is some testing to verify that things work. First. 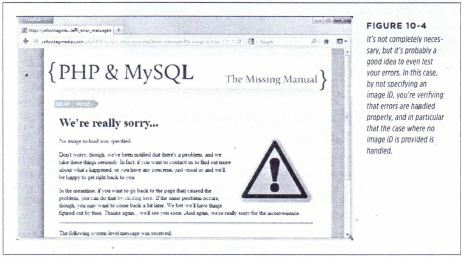 start MySQL and find an image that’s been inserted. Make a note of that image’s ID. 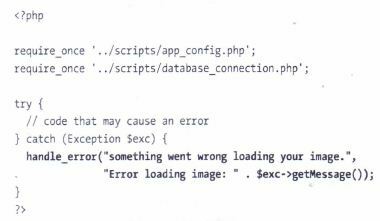 Next, open your browser and type the URL for Show_image.php, but don’t press Enter; if you do, you should get the error shown in Figure 10-4 because you didn’t supply an ID. Now, add the image ID to the URL like this show_image.php Put that in your browser’s address bar (along with the rest of your domain name and path), and you should see something similar to Figure 10-5.